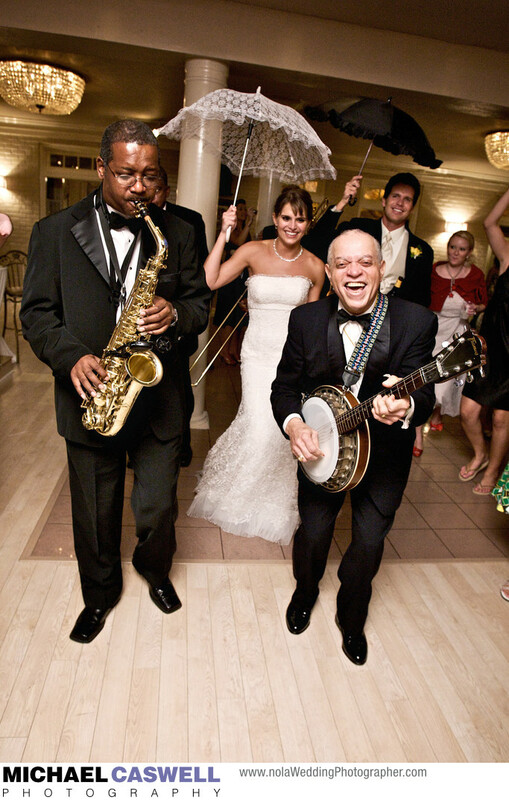 New Orleans music legend Deacon John smiles broadly, leading the happy bride and groom on a second line through Southern Oaks Plantation's elegant ballroom as the guests follow behind. A tradition throughout the New Orleans area, it's very rare for a wedding to not have a second line of some sort, whether a full-fledged parade through the streets of the French Quarter, or around the reception venue such as in this case. Either way, the newly married couple will usually carry umbrellas, while the guests will wave napkins or personalized hankies in the air. Active on the New Orleans music scene since the 1960s, Deacon John is a loved figure and consumate musician, and performs regularly at events with his band, The Ivories.